Through the course of almost 20 years on Alligator Records, Charlie Baty of Little Charlie and the Nightcats has proven himself to be a one of his generation’s best blues and swing guitarists. That legacy continues on the latest Nightcats record, Nine Lives. So, what’s Charlie practicing these days? As a result, Baty says polka does enter the equation, in case you’re wondering. But he also points to the use of the instrument in jazz and Western swing. But if you’re thinking there may be lots of oompah influence on the new Nightcats album, you’d be wrong. There’s lots of what you’d expect: R&B, swing, old-fashioned ’50s-style rock, and even a little bit of surf music (on the cut “Slap Happy”). The record has the usual great songs written by singer/harp player Rick Estrin. The record presented other challenges, too. It might surprise some to find out that the Nightcats are the only band Charlie has ever played in. And he didn’t start out as a guitarist, but a harp player. His early influences remain his main ones to this day. Baty’s favorite guitars are Gibson hollowbodies, but he has been using a Strat more in recent years. Onstage, Baty usually has a couple of Strats and an ES-295 or ES-175. And as far as amps go, “I’ve always liked the Fender Super Reverb. 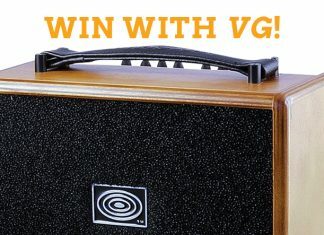 There’s a company now that’s making their own version of that amp – Vero, out of Joliet, Illinois. I like their Chicago Zephyr. It looks like some kind of Biblical treasure.” With a laugh he adds, “It’s all gold and glows.” He’s also fond of Vero’s 20th Century Limited, but says he tends to play pretty much anything in the studio. The Nightcats will soon have a website (littlelecharlie.net) that will include an equipment section to let fans look at everything they use. As any fan of the band knows, Charlie’s got chops to burn. How does he keep them up?